They beat on the fence with the coffins as they chanted "NO BLOOD FOR OIL!" I photographed this crowd of demonstrators as they protested the U.S. imposed sanctions against Iraq. The protest took place on 8/15/2000 directly in front of the Staples Center and attracted some 1,000 demonstrators. The dissidents are holding small coffins representing the Iraqi child who have died as a result of the sanctions. Over 1.5 million Iraqis have died to date from the life crippling sanctions. The previous day the LAPD had assaulted people with Teargas for attempting to climb this very fence. During the sanctions protest dissidents hung hundreds of the tiny coffins on the fence. 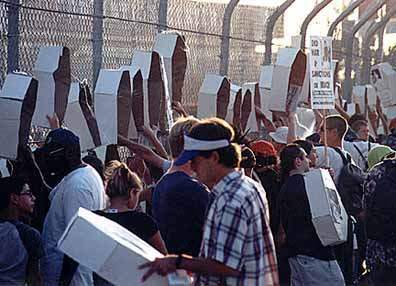 They beat on the fence with the coffins as they chanted "NO BLOOD FOR OIL!"